Award-winning Author Jarrod L. Edge is the creator of the E7 Prophecy Universe of Christian sci-fi fantasy books. He spends much of his life in St. Augustine, FL and Des Moines, IA either working on the series or teaching. His inspiration derives from his Christian beliefs. Jarrod has been recognized for his ability to take Christian concepts and relay them to his readers in a fun, action filled way. Through the series within the E7 Prophecy Universe, Jarrod takes readers on fantastic journeys, traveling throughout the United States, the world, and even into space to fight an interstellar war against evil and the forces of darkness. Jarrod loves spending time with his wife, Lisa, and their four children, Kari, Taevon, Edward, and Isabella. Jarrod is currently working on several short stories in a series named The Acts of the Seven Dragons, also a part of the E7Prophecy™ series. Each of his four children will co-author individual short stories about the “acts” of Rebecca, Matthew, Jacob, and Elizabeth (aka. The Dragons). Jarrod and his youngest daughter, Isabella, have already won an award for The Art of Eten Chu, one of the books in the series The Acts of the Dragons. They are looking forward to many more collaborations. Jarrod and his family are Christians and love learning about and growing in the Lord. 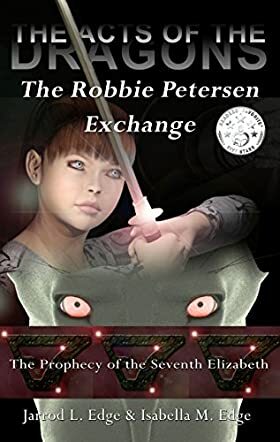 The Robbie Petersen Exchange (The Acts of the Dragons Book 2) by Jarrod and Isabella Edge is a highly imaginative story based on four siblings with extraordinary skills, who also work for the FBI. The children go on a secret mission to uncover information about a gang at a local New York City school called the EPOLICS. But that is not all they uncover. They expose an even deeper conspiracy to wipe out “the light” from the world through an evil video game. With the help of a new-found friend, Robbie Petersen, a boy who has plenty of his own issues, the siblings are able to take down the bad guys once again. Embedded within the story, Elizabeth makes contact with and befriends aliens with strange abilities in an underground tunnel. Super fun, with lots of action, and extremely well told. The Sette siblings, Matthew, Jacob, Rebecca and Elizabeth, will take you on a mission you won’t soon forget. While The Robbie Petersen Exchange is full of action and adventure, it also brings with it a message. Elizabeth, the sibling who receives messages from God to deliver to others, is an energetic seven-year-old who has compassion for others, yet is not afraid to do what she has to do to take down the bad guys. It’s truly refreshing to read a children’s story that contains just the right combination of imagination and spiritual principles. Jarrod and Isabella Edge do a delightful job of leaving the reader with a message of faith and hope. This is the second installment in The Acts of the Dragons series. I am excitedly waiting to see what will happen next with the Sette siblings.